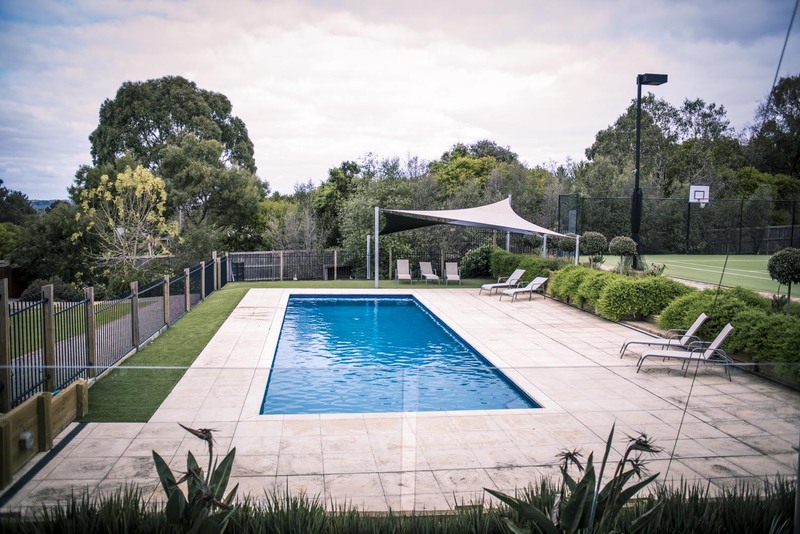 Momentum Pools can build or renovate all types of swimming pools from lap pools sitting atop apartment buildings to backyard pools filled with neighbourhood kids during a summer heatwave. We build in-ground pools from the perspective of the end user: people like you. The customer came up with the idea to add an acrylic viewing panel on his existing pool. To this he advised his architect, who renovated the home with the acrylic viewing window as the showpiece. Pool design is an extension of current building trends. Ever larger homes are being built on smaller blocks of land with ever appreciating market value. 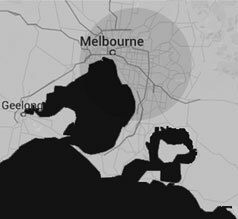 As a result the area available to build a swimming pool is increasingly compressed. New planning regulations, and advances in technology and construction methods means pools can now be built along property and building boundaries to maximise the use of space. This is a long way removed from the pools of the 70’s and 80’s which often form the touchstone by which current pool purchases draw on. Everyone either had their own pool or a neighbours pool where they would congregate as kids (those were the days of ¼ acres blocks, 16m² homes and free-form pools built in the centre of the backyard with a full perimeter paving surround – and oh yeah – no pool fence. Compare this to sub 600m² blocks, 40m² plus homes and full perimeter fencing. New but old, this pool encapsulates the past style of building a pool in the middle of the backyard, complete with wrap around paving surround. Note the pool fence. Build the pool in an area that won’t section off a large area of your backyard. On small blocks, build against the property boundary – that means you can use existing boundary fence as part of pool fence detail. Reduce the size of the area within the pool fence as it’s not usable outside of summer and if your kids are using the area within the pool fence, you will always need an adult to supervise their activities. You don’t need full perimeter access to the pool. Single or double sided access to the pool is all that is required. This also applies to full perimeter paving surrounds. Build the pool in an area where it’s most visible from the living areas of the home so you can keep an eye on the kids or view it as a showpiece. 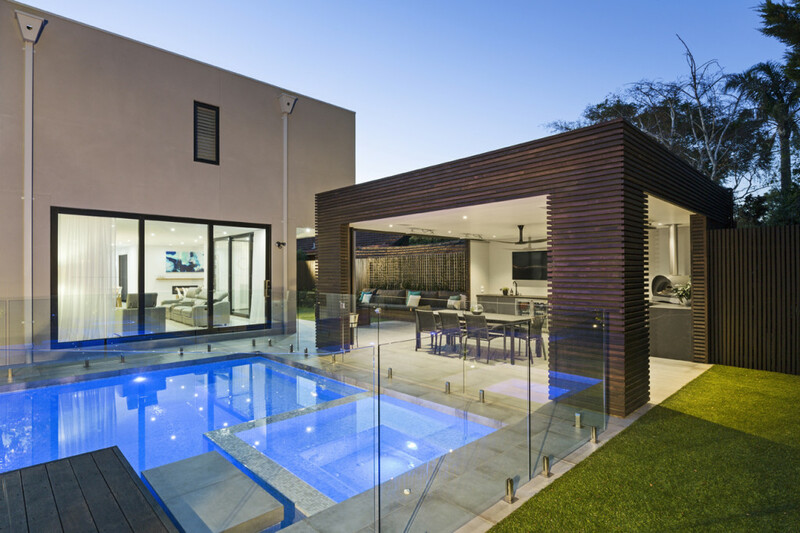 This pool captures the modern design brief, built on the property boundary as well as the residence boundary and in full view from all living areas it abuts. It’s a showstopper, which relies on a modern in-floor cleaning system to keep it clean, as it can only be accessed from a single paved entry side. Nobody does laps in a lap pool. If you have kids, they will always use the pool (so build it with kids in mind). Domestic pools can’t be made safe to dive in – so don’t consider making the pool safe to dive in. Just discourage the practice. The most used areas in the pool will always be areas where you can sit or lie down below water level. So pay attention to step, beach and bench areas. Build areas like spas and steps so they are either built internally within the overall pool shape or half in/half out. It’s not fashionable to build these areas external to the pool form. There should be a logical progression so you can transition from the house to the pool – this means locate the exit point from the house, the pool fence gate and pool steps in a sequence that provides continuity for seamless use. Note the extensive use of recreating areas within both the pool and spa. The steps and bench seat form a continuous seated area wrapping around the spa weir wall. The number one determinant of how often you will use the pool is water temperature. The bigger the pool you build the more expensive and harder it will be to heat the pool, irrespective of what method of pool heating you use. So consider the size of the pool carefully. Design the pool so it’s an extension of the architecture of your home. If your home is a modern recti-linear house, build your pool the same, with right angle corners and straight lines. Ditto for period homes – make use of sweeping radius corners and Roman ended pool shapes which give a classical look. Integrate the pool into the backyard. If you have a slope to the property, build the pool to take advantage of this. You could use an acrylic viewing window for a backyard and pool raised relative to the house, so you can look into the pool from the living area. Similarly if your block slopes away from the front to the back fit a horizon or negative edge. A retaining wall along a property boundary can be incorporated into the pool design through building a raised planters along pool edge. If you’re tight for space and need to build the pool close to the building boundary, build the house on the pool shell and fit floor to ceiling fixed windows – the effect can be a show stopper (see example below). We designed this pool to fit into the angled property boundaries as well as work with the sloping block. Note the way the retaining wall is continued through the raised pool planter box that also showcases the raised spa and integrated water feature. Try to balance hard and soft finishes. For instance if you have a large 2-storey rendered home – use pot plants, planters and strip garden beds to break up the paving. Timber batons and decking will also help to soften the hard masonry surfaces. Course finishes to cladding on walls can help to add texture to otherwise smooth render and paved finishes. You don’t want your backyard to look like a stone tomb – so consider this aspect of your decision deeply. Current design trends lean towards large format type products with an overall minimalist feel in relation to the number of product selections. Think hard before you use light coloured paving products outside – as they readily stain and discolour. Darker finishes wear staining better. If you have to use a light coloured product, use something with colour mottling or a variegated appearance as it will be less likely to show staining than uniformly light coloured paving products. A good colour combo is a light coloured pool interior and dark coloured paving. This is especially so if you don’t have a lot of natural light over the pool. If you do have a lot of natural light cast over the pool you can probably get away with a dark pool interior. In terms of pool coping – look for large format products which have a large vertical cross section to the coping overhang. This pool features a light coloured pool interior, timber batons and decking to soften and prevent a “closed in feeling” from it being hemmed in by the home and property boundaries, as well as large format bluestone paving on the near side and a polished concrete raised plinth and paved surround. The final rule is – it’s your pool. You are paying for it, so break the rules and do what you want – just make sure you consider the above (from the pool builders perspective, it’s always better to build an ugly pool that clients love than a funky one they hate). The rule breaker: a St Kilda residing California Bungalow home, with a super funky stone lined, graffiti mural backyard. The pool captures the essence of the Bohemian inner urban suburb – amidst the mid century suburban styling of the home. The effect is just: original.